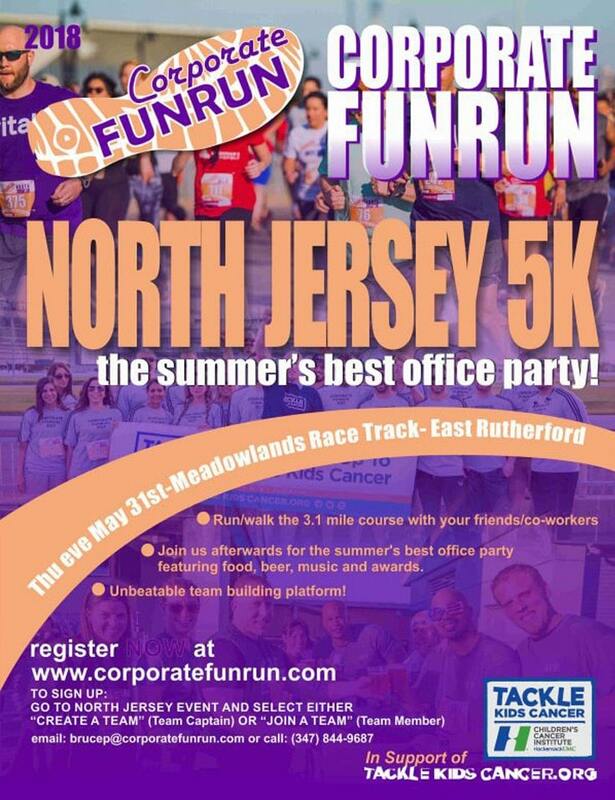 Tricarico is participating in the North Jersey 5k Corporate FunRun on May 31st!! The event’s exclusive charity partner is Tackle Kids Cancer, Children’s Cancer Institute at Hackensack Meridian Health. We have set up a Tackle Kids Cancer Tricarico Team Page for online donations with a goal of raising $5,000 in support of pediatric cancer research. We care about finding a cure for pediatric cancer, and we hope you do, too! The Children’s Cancer Institute at Hackensack Meridian Health has stood as a beacon of hope for children and families dealing with pediatric cancer…but more can be done. Pediatric cancer is the #1 cause of death by disease among children in the US and only 4% of cancer research dollars are allocated to pediatric cancer. These facts are devastating, but the doctors at the Children’s Cancer Institute are working tirelessly to find a cure. Please support us and help end childhood cancer! It takes a team to be successful and with your support, we hope to reach our goal. Even $20 would make a big difference for the pediatric cancer patients at the Children’s Cancer Institute. Thank you for supporting our team and we encourage you to join us in this effort! Click the DONATE NOW button to donate to our team page. Together we can make a bigger impact in this fight against pediatric cancer. Remember… together WE CAN Tackle Kids Cancer!